Motorbike Accident Lawyer Denver CO | The Law Office of Richard J. Banta, P.C. Let a qualified motorbike accident lawyer Denver, Colorado help you. 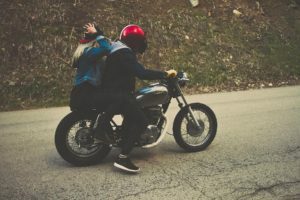 If you were a passenger on a motorcycle involved in a crash and you sustained injuries, the law allows you to pursue for damages against the party or parties responsible for the crash. Motorcycle Accident lawyer Denver CO, Richard J. Banta, has successfully represented many motorcycle accident victims in obtaining the financial compensation to which they were entitled for the injuries and losses they suffered. Contact a seasoned Denver, CO motorbike accident lawyer at Richard J. Banta, P.C. today to set up a consultation and find out how we can help. In many crashes, the driver of the other vehicle is the person who behaved in a negligent manner and caused the accident. One of the most common types of crashes our we see involves the driver of the other vehicle turning in front of the motorcycle operator when the motorcycle has the right of way, such as taking a left-hand turn in front of the bike. A skilled motorcycle accident attorney will investigate the crash and gather the evidence which will show the other vehicle driver was at fault. In some crashes, the motorcycle operator is to blame for the accident, either due to driving recklessly, distraction, or inexperience. Some of the more common causes of the crashes our motorcycle accident law firm have handled involve speeding, weaving, tailgating, or illegal passing on the part of the operator. These dangerous behaviors often cause the operator to lose control of the bike and crash into other vehicles, stationary objects, or the bike flips over. If you were the passenger on a motorcycle, the driver may be responsible for your injuries. Defective motorcycle parts are also another common cause of motorcycle crashes. The most frequent issues occur with brakes or tires, which can lead to bad crashes. Some accidents have been caused by defective fuel tanks or cracks in the motorcycle frame itself. When the cause of the crash is a defective part, a motorcycle accident attorney will determine which party or parties is liable for the victim’s injuries. It could be the company that manufactured the part, the company that manufactured the motorcycle, the wholesaler of the vehicle, the distributor, or the retail establishment which sold the bike. It is not uncommon for the victim of a motorcycle crash to not be able to identify the responsible party right away. This is where having a seasoned Denver, CO motorbike accident lawyer like The Law Office of Richard J. Banta, P.C. representing you is crucial. You need to focus on your recovery. Call today to let our Denver, Colorado motorbike accident lawyer legal team focus on determining who is liable for your injuries and making sure they pay you the compensation to which you are entitled.